Great news for Bioshock fans, as the team at Irrational Games announce two DLC for Bioshock Infinite. The first DLC is actually available right now, called Clash in the Clouds, a firefight battle arena-style game modeled after the game’s 1999 mode, where you mow down waves of difficult enemies. 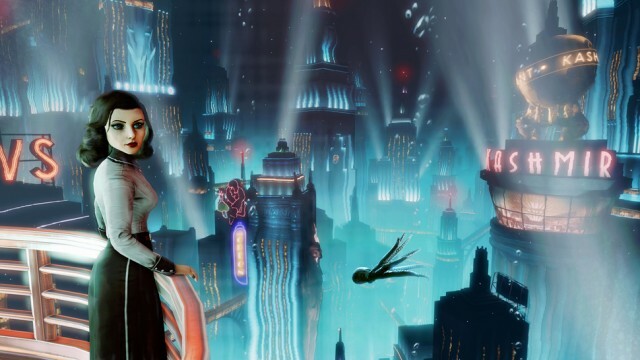 The second DLC is yet to have a release date, but is the first of the two-part story DLC called Burial at Sea, which puts the lead characters of Infinite into the iconic city of Rapture from the first BioShock. For anyone who doesn’t own the Season Pass, Clash in the Clouds is available today on Steam, PSN and Xbox 360 and costs $5. It includes four challenge maps The Ops Zeal, Duke & Dimwit Theater, Raven’s Dome and Emporia Arcade, where players have to fight through 15 waves of enemies. Each wave will include a Blue Ribbon Challenge with a unique, difficult objective, and leaderboards will track your scores on each map and allow you to compare with friends. Clash in the Clouds also includes the Columbia Archaelogical Society, an in-game museum players can explore to view character models, concept art, behind-the-scenes videos and more. Levine also announced some changes to the gameplay, and some additional features in the upcoming DLC.